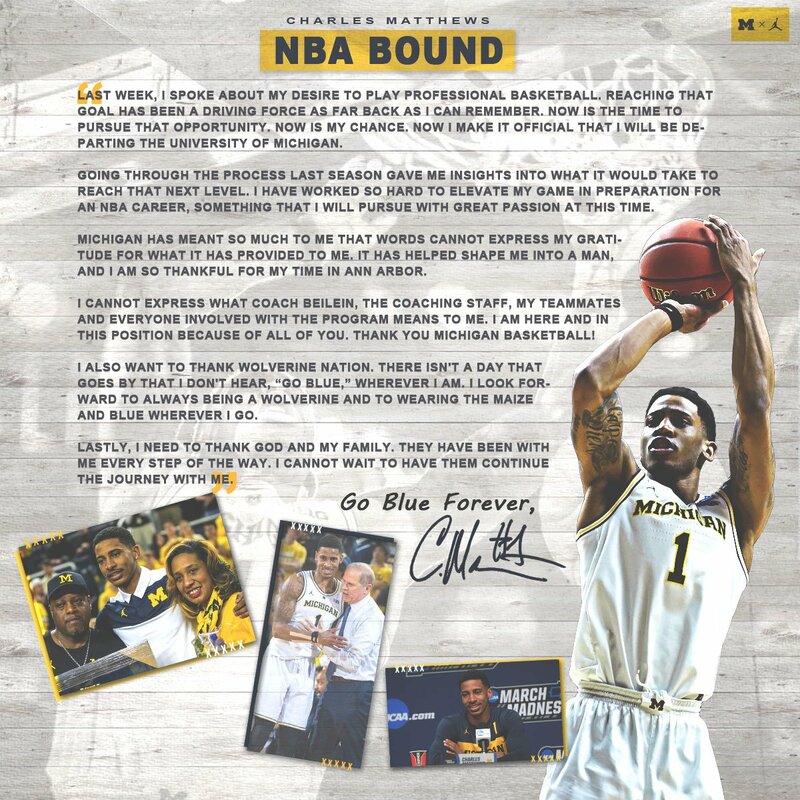 Michigan announced today that Ignas Brazdeikis, Jordan Poole and Charles Matthews have all declared for the NBA Draft. Under newly adopted NCAA rules, college players are allowed to retain the services of an agent during the evaluation process. If they choose to return to school, they must end the relationship with the agent and they will not lose any eligibility. Additionally, players can also now return to school after going undrafted without losing eligibility, but only if they have participated in the NBA combine. Best of luck to all three. Can’t ever fault someone for trying to make the move up and getting paid. I’m sure Beilein and staff have a pretty good idea which of the three are definitely gone so they have a good idea about how many scholarships they have to recruit with in the next few months. Not trying to imply they are excited about any of the three leaving, but I think the silver lining is they have the opportunity to recruit some specific needs. That might be a stretch to say given the limited talented pool they’ll have to choose from, but Beilein has proven he has an ability to adapt to early departures and transfers. I wouldn’t get your hopes up too far. I like Eli. He hustles on D and seems like a good kid, but he’s never shown the ability to put the ball in the basket as a 2. He’s way undersized at 6’1 and he’s not an explosive athlete. He has clear physical limitation that are going to hold him back. There’s a large enough sample size, 68 games, that should give us a clear view of expectations for him. He averages 2.2 PPG over his 68 games. He shoots 27% from three and 35% overall for his career. We should expect him to be a hustle guy off the bench who can help spell X a bit. I like Ant but giving James Yoder a platform is a terrible decision. Yoder is a harmful parasite to the Michigan athletic program. Matthews is officially in the draft. Do you think NBA analysts will describe him as a Kentucky transfer?